Since last night, five laser lights shine westwards through Hamburg’s evening sky to Schenefeld at a height of 50 metres. It is here in Schenefeld, that the world’s brightest X-ray light arrives in the underground experiment hall. Here is the video. Hamburg says &apos;welcome&apos; to European XFEL! The light and laser installation will run every evening until 3 September. The laser over Hamburg and the message projected on the Kaispeicher warehouse at the base of Hamburg’s new concert hall and landmark, the Elbphilharmonie, welcomes the European XFEL to the metropolitan area of Hamburg. 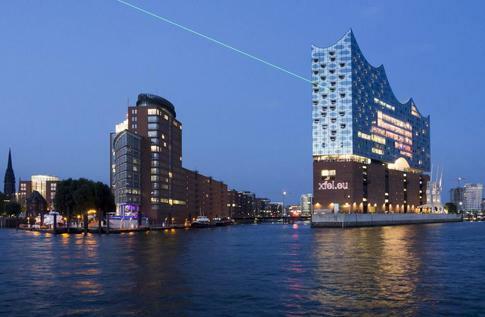 The lasers were set off from the Elbphilharmonie, the Philosopher’s Tower at the University of Hamburg, the E-Hochhaus building at the Hamburg University of Arts and Sciences (HAW Hamburg), the Hamburg Planetarium, and the offices of the Hamburg Department for Science, Research, and Equality (BWFG). 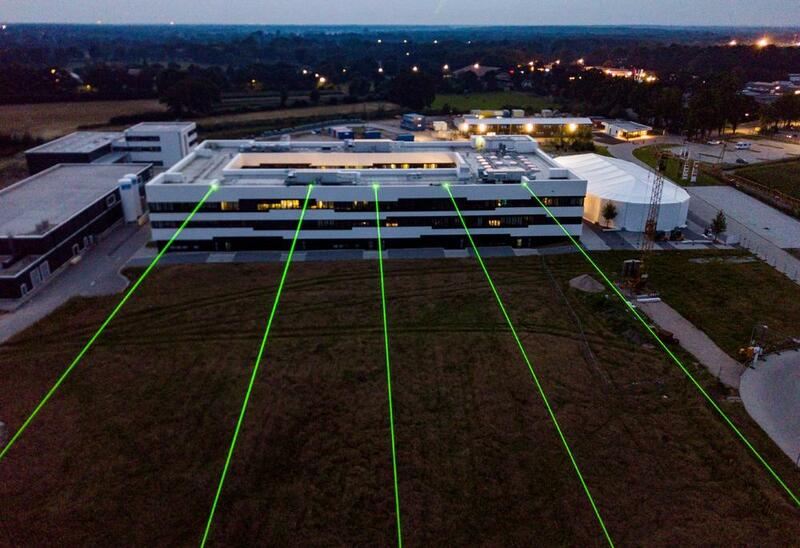 In Schenefeld, five other lasers at the same height highlighted the underground path of the tunnel fan of the European XFEL. The laser installation will be visible every evening until 1am, ending on 3 September. 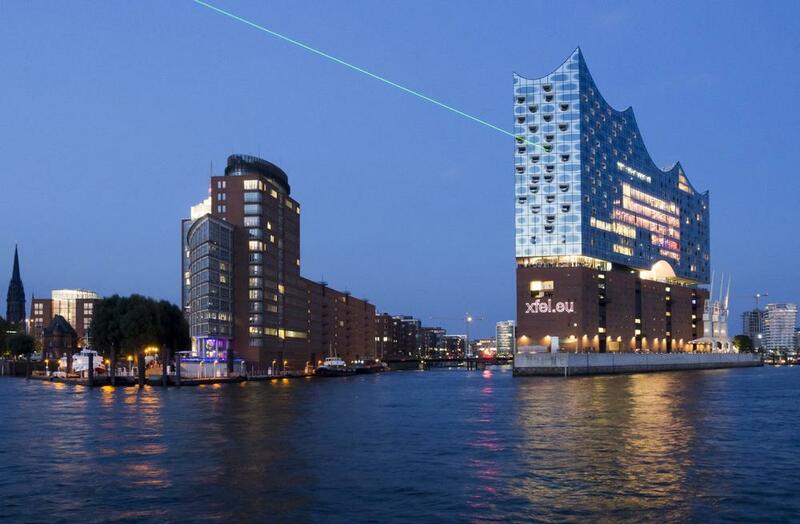 The 100-watt strong green laser from the Elbphilharmonie can be seen from up to 24 kilometres away. The message “Welcome European XFEL”, displayed in the eleven languages of the partner countries of the international research facility, is projected on the side of the Kaiserspeicher. The lasers provided by the science community from the Philosopher’s Tower, the E-Hochhaus of the HAW Hamburg, the BWFG building, and the Planetarium lit up areas of the sky further north. Laser heads with a strength of 20 watts provided a welcome greeting, which can be seen as far as the western banks of the Alster. In Schenefeld, five additional lasers replied to the welcome greeting from Hamburg. 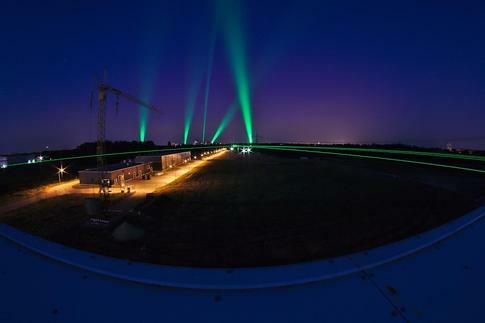 The laser beams in Hamburg’s night sky have a total length of about 72 kilometres. 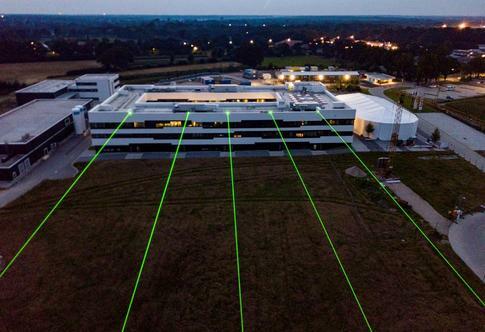 Five lasers situated on the roof of the main building in Schenefeld highlight the five underground tunnels of the European XFEL (Credit: European XFEL).